Are you having a hard time getting things done? Need a little help in this department? Here you can learn about doTERRA for focus uses with recipes. I explain all about essential oils for concentration and all the ways you can use them and how to use them. I have an extensive list of doTERRA focus diffuser blend recipes to choose from that will help you stay on task. I know I sure can use any help I can get to help me keep focused on what I’m working on. 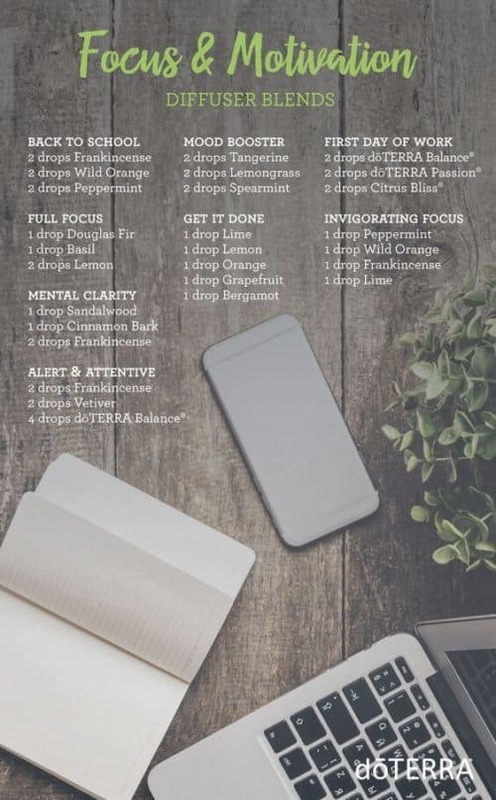 I love to diffuse these doTERRA diffuser blends during homework time and when I’m working on my blog. They help me not get distracted and help keep me working hard on projects that may not be my favorite. Please let me know if you try one or all of these and if you think they help. Basil Essential Oil Diffuse Basil to promote a sense of focus while studying, reading, or completing other tasks that require mental clarity. Frankincense Essential Oil Diffuse Frankincense during your morning yoga practice to focus your intention for the day. InTune Focus Blend doTERRA’s proprietary blend that enhances and sustains a sense of focus. Douglas Fir Essential Oil Promotes a positive mood and sense of focus. Spearmint Essential Oil Promotes a sense of focus and uplifts mood. Diffuse one or more of these doTERRA essential oils in your diffuser when you want to improve your focus and concentration. Do you like my list of doTERRA Focus Blend recipes? Which ones are your favorite essential oils for focus?